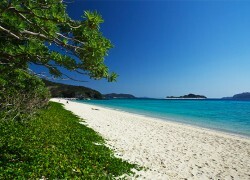 Five minutes from Zamami Port by vehicle. There is a facility in the vicinity called Kujiranosato, which offers campsites, bungalows and a swimming pool. Even though Ama Beach is not as busy as Furuzamami Beach, it is a convenient spot with shops and food concessions available during the high season.